Lucasfilm’s “Solo: A Star Wars Story,” directed by Academy Award–winning filmmaker Ron Howard—the creator of unforgettable films, such as “A Beautiful Mind,” “Apollo 13,” “Parenthood” and “Splash”—is an action-packed journey that explores Han’s first encounters with future friend and copilot Chewbacca (Joonas Suotamo) and notorious gambler Lando Calrissian (Donald Glover). The film takes viewers on a ride showing Han’s adventure-filled past alongside fellow street thief Qi’ra (Emilia Clarke) and career criminal Beckett (Woody Harrelson). “Solo: A Star Wars Story” bonus material takes fans behind the scenes with the star-studded cast and screenwriters Jonathan Kasdan & Lawrence Kasdan (writer of Star Wars: The Empire Strikes Back and Star Wars: Return of the Jedi). 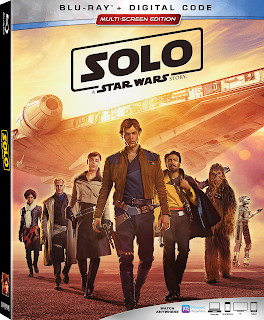 Special features include a revealing feature on Chewie and his enduring friendship with Han; a close-up look at the original version of the Millennium Falcon and Han’s first time piloting the infamous ship; the creation of the film’s otherworldly settings and pulse-pounding action sequences; and eight never-before-seen deleted and extended scenes. Watch instantly on Sept. 14th as the Millennium Falcon sets course digitally in HD and 4K Ultra HD™ and on Movies Anywhere, and bring the adventure home on Blu-ray 4K Ultra HD™, Blu-ray™, DVD and On-Demand on Sept. 25.